I scream, you scream, we all scream for ice cream...and sorbet! We love homemade ice cream and sorbet around hear. When summer hits, the ice cream maker comes out of storage and works it's little heart out, for as long as the thermometer stays above 80 degrees. I don't' have one of those fancy or expensive indoor machines either. I've actually tried them and returned them. Nothing works as well as my old fashioned ice and rock salt churner. It's a little loud and can be messy so we make it out on the back porch, but it makes the best ice cream. Last weekend was our machines summer debut. 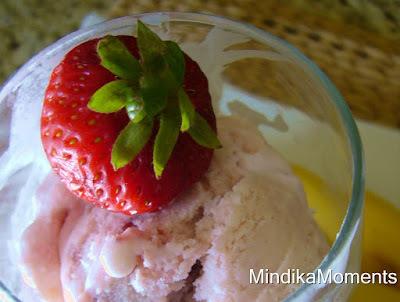 We made strawberry banana ice cream and welcomed summer officially! 1. Mix scalded milk, sugar, salt and vanilla until sugar and salt are completely dissolved. 2. Add half & half, cream and fruit or candy. 4. Pour into ice cream machine and freeze according to manufacturer’s instructions. Flavor ideas: Any favorite fruit pureed, or your favorite candy bar, nuts etc… You can experiment with all kinds of flavor combinations as well. One of my favorites is pineapple, coconut & walnuts. Have fun! The following are some of my favorite sorbet recipes. I'm a huge fan of sorbet. It's a lot less fattening than ice cream and so refreshing on a hot summer day! 2. Add puree and lemon juice. Cool in refrigerator for 2 hours. 3. Pour into ice cream machine and freeze according to manufacturer’s instructions. 1. Combine water and sugar in a saucepan and bring to a boil over medium heat stirring constantly until the sugar has dissolved. Cool. 2. Puree the kiwis in a food processor. Set aside 1 C. puree. 3. Strain the remaining puree through a fine sieve. 4. Combine both purees and the syrup in an ice cream maker and freeze according to manufacturer’s instructions. 1. In a blender, puree the mangos, cantaloupe, maple syrup, water and lime juice until very smooth. 2. Poor into ice cream machine and freeze according to manufacturer’s instructions. 1. In a blender or a food processor, puree the peaches. 2. In a large saucepan, combine the sugar, orange juice and lemon juice. Over medium heat, cook and stir until the sugar dissolves. 3. Remove from heat. Stir in peaches. 5. Poor into ice cream machine and freeze according to manufacturer’s instructions. 2. Puree the pineapple and work in through a sieve to remove the fibers. 3. Stir the sugar syrup, lemon juice, and the rest of the water into the puree. 2. Puree the raspberries and work in through a sieve to remove the seeds. 1. Place the sugar, water and lemon juice in a small saucepan. Bring to a boil, stirring occasionally. 2. When the sugar is dissolved, remove the pan from the heat. Allow to chill in the refrigerator for 1 hour. 3. Prepare the watermelon by removing all the seeds from the flesh. 4. Puree in a food processor. 5. Add to the chilled syrup. 6. Poor into ice cream machine and freeze according to manufacturer’s instructions. Hi! I made this and your recipe for grilled pizza today for my friends and family. It was soooooooo good! Thank you for great recipes!